I have around 100 websites on a single server, all in j3.2.x all working fine. Now if i want to add a single module/component/plugin in all the websites i have to log-in in all the websites and add the respective module/component/plugin. Is there a way to update all the websites in one click or through copying folders or updating the database...?? or any other way to apply the changes to all the websites??? because going to all the websites and applying the changes is a lot of work. A subscription based service, to monitor, audit, backup, manage, update Joomla sites remotely from a single location. You install the Watchful.li client into your sites and start using the service. You can setup your sites under a Multi-Sites environment, if your scenario is fitting in. If sites are under the same hosting account, you could look into developing the Multi-Sites environment, especially if they have similar features/purpose, and you still need to create more similar websites. If sites are under the same server (not hosting) but still have similar features/ purpose, you could put them under a single hosting account in a MS setup. Setting up Multi-sites will require some work, and it won't be that easy in the beginning, but if the use-case is a good fit, it will make things much more flexible in the future and at the end you will have to maintain a single Joomla installation. Here you find extensions for Multi-Sites. Not the answer you're looking for? Browse other questions tagged joomla-3.x update administration one-click-updates maintenance or ask your own question. 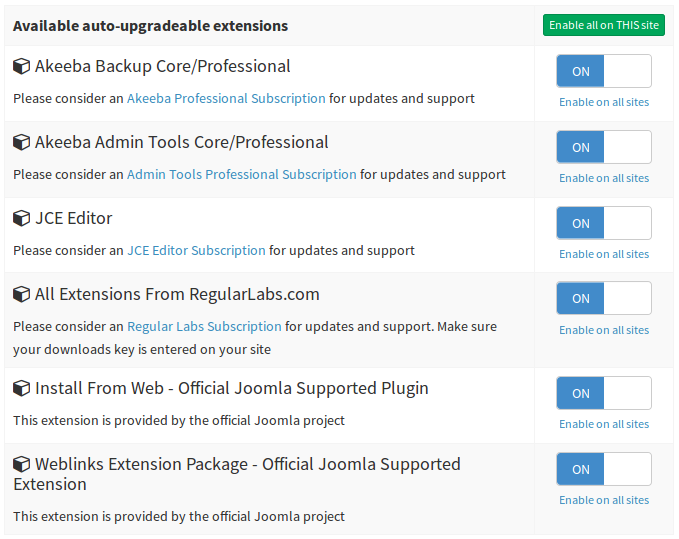 Does joomla updates by itself?